The solar corona is a beautiful sight during total solar eclipses. It is the uppermost region of the extended solar atmosphere and consists of a very hot (over 1 million degrees), tenuous plasma of highly ionised elements that emit strong X-ray radiation. There is also a much weaker coronal emission in the optical part of the spectrum. The Sun is a normal star and X-ray observations from rockets and orbiting X-ray telescopes have shown that many other stars also possess coronae. But due to observational limits of the telescopes available so far, the much fainter optical emission from stellar coronae had never been detected. Now, however, an optical coronal line from iron ions that have lost 12 electrons (Fe XIII) has for the first time been observed in a star other than the Sun. The object, a cool star named CN Leonis, is located at a distance of 8 light-years. This impressive observational feat was performed with the UV-Visual Echelle Spectrograph (UVES) on the VLT 8.2-metre KUEYEN telescope at the ESO Paranal Observatory, within a programme by German astronomer Jürgen Schmitt and his collaborators at the University of Hamburg Observatory. The possibility to observe stellar coronae with ground-based telescopes opens up new and exciting research opportunities, including the detailed study of stellar cycles, similar to the 11-year solar period. Two years ago, on August 11, 1999, the shadow of the Moon moved rapidly across Europe and millions of eager observers experienced a total solar eclipse, many for the first time in their lives. Those who had a clear view during the 2-min phase of totality were able to see the glorious solar corona, a shimmering halo of light around the eclipsed solar disk, c.f. ESO Press Photo eso0127 . Some 130 years earlier, during a total solar eclipse on August, 7, 1869, American astronomers William Harkness and Charles Young observed a weak spectral emission line from the solar corona in the green region of the spectrum; it was visible for a couple of minutes. 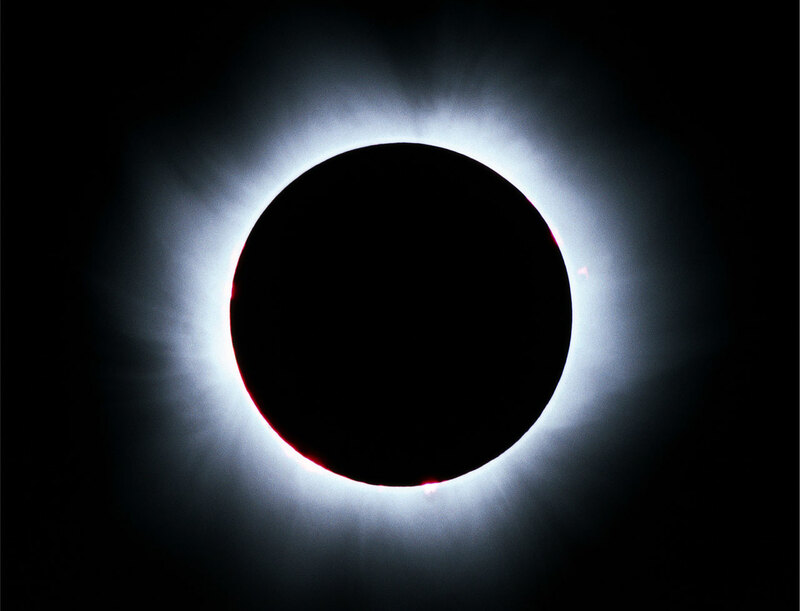 However, despite an enormous amount of work, both at the telescope during subsequent eclipses and in the laboratory, this emission line could not be attributed to any known chemical element. As the years passed, the mystery of the origin of this emission line deepened and some astronomers went as far as introducing an entirely new element named 'coronium' . As better instruments became available, more coronal lines were seen during later solar eclipses. It was only after 70 years that the coronium mystery was finally solved by two astrophysicists, Walter Grotrian from Germany and Bengt Edlén from Sweden. They showed that two observed emission lines arise from iron atoms which have lost about half their 26 electrons. By 1941, all of the coronal lines had been found to originate from such highly 'ionized atoms'. The successful identification created, however, another puzzle: in order to strip iron atoms of half of their electrons, temperatures of more than one million degrees are required, yet the temperature of the surface of the Sun is only of the order of 5500 °C! The astronomers in the 1940's were well aware that the Sun's energy is produced in the interior and that heat flows outwards from hotter to cooler regions. So how could there be a much hotter corona above the cooler photosphere? Since then, much research effort has been aimed at understanding the transport of energy in the solar atmosphere and it appears that several mechanisms play a role, including magnetic and other effects. Nevertheless, a full and detailed explanation of the high temperature of the solar corona is still outstanding. An ionized gas (a 'plasma') at temperatures of a million or more degrees emits most of its energy at short X-ray wavelengths. X-rays do not penetrate the Earth's atmosphere and can therefore only be studied from space. Soon after World War II, the predicted X-ray emission from the solar corona was detected by American astrophysicist Herbert Friedman and his colleagues, using an X-ray detector onboard a German V-2 rocket, and hereby inaugurating the rich field of solar X-ray astronomy . The Sun is a quite normal star and other stars therefore ought to possess coronae as well. Still, it took nearly 30 years until X-ray emission from other normal stars was finally detected. While X-rays from several distant objects (including the Crab Nebula, the Galactic Centre and the quasar 3C273) were discovered during the 1960's, it was only in 1975 that X-rays were registered from the bright, normal star Capella (Alpha Aurigae) during a rocket flight to study other X-ray sources. In fact, this discovery was accidental, as Capella happened to be used as a 'guide star' while the pointing direction of the rocket was ''hopping'' from one object to the next. Quite surprisingly, Capella was found to be a very strong emitter of X-rays, corresponding to an intrinsic level of more than 1000 times that of the solar corona. This discovery laid the foundation for the subsequent detection of X-ray emission from tens of thousand of stars by means of X-ray satellites, e.g., by the Einstein Observatory and especially by ROSAT. All these observations showed that stellar coronae must be a very common phenomenon. Given this widespread occurrence of stellar coronae, Jürgen Schmitt and his collaborators at the University of Hamburg (Germany) asked themselves the natural question: "What about coronal line emission from other stars in the optical (visible) region of the spectrum ? Wouldn't it be a good idea to observe coronal emission from other stars with ground-based telescopes ? In any case, observations from the ground are easier to perform and are also more economical than from space" . This may be easy to say, but it is much harder to do. The main problem is the same as when observing the solar corona. The solar coronal emission lines in the visible region of the spectrum are always observed above the solar limb. If one were to try to detect these weak lines in front of the solar disk, they would "drown" in the strong background light from the solar 'surface' (the photosphere). The original discovery of coronal emission in 1869 was indeed obtained during a solar eclipse, when this strong light is completely blocked out by the Moon. However, current telescopes are unfortunately unable to block out the light from a stellar disk in a similar way in order to make its corona visible; the angular size of the disk is too small and the positional accuracy needed for such an observation is too high for it to be feasible with present techniques. The only way forward is then a direct attempt to detect the faint coronal emission against the much higher background of the stellar disk - and that is exactly why a very large telescope is needed for such an observational feat. In order to increase the chances of success, Jürgen Schmitt and his colleagues decided to focus on optically faint, red dwarf stars . Such stars may have the same X-ray output (or even larger) than the Sun, and hence presumably possess pronounced coronae, yet their disks emit over one thousand times less visible light than does that of the Sun. They first turned their attention towards an optically faint (visual magnitude 14) and nearby (distance 8 light-years) red dwarf star (of type M5.5) known as CN Leonis, c.f. ESO Press Photo eso0127. It is located slightly north of the celestial equator in the constellation Leo (the Lion) and the two-letter name indicates that it is a variable star. It has been found to undergo sudden brightenings (it is a 'flare star'), and exhibits strong magnetic activity. It is also a source of strong X-rays which the German astronomers had previously studied with the ROSAT satellite observatory and they therefore considered this star as an excellent first choice for a coronal study with the VLT. 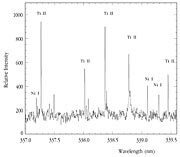 A spectrum of CN Leonis was obtained with the VLT UV-Visual Echelle Spectrograph on January 6, 2001. 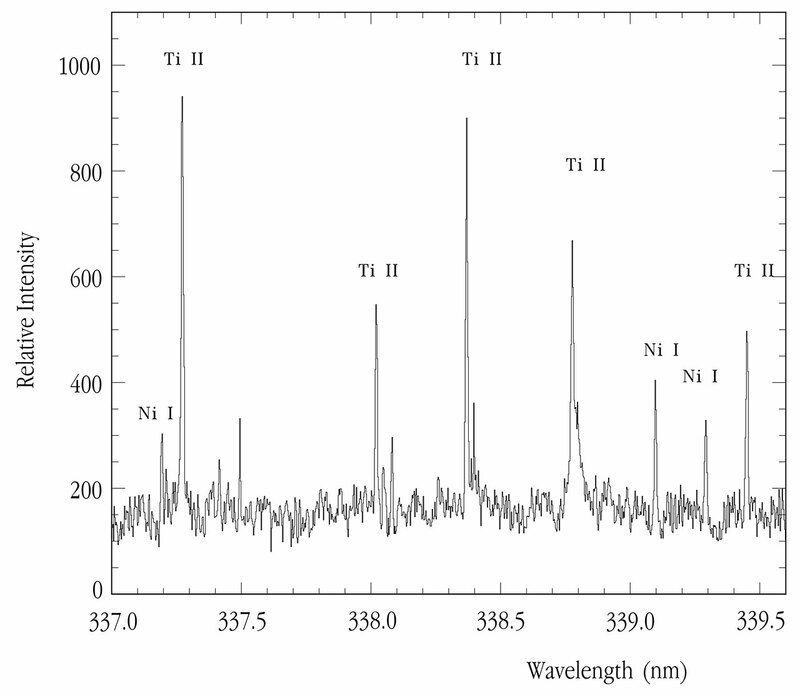 The spectrum covers a wide spectral region and is extremely rich in emission lines, but the team was mainly interested in one particular emission line, seen in the ultraviolet part of the spectrum at wavelength 3388.1 Ångstrom (338.81 nm). This is the wavelength at which a coronal emission line arising from 12 times ionised iron (denoted as Fe 12+ or Fe XIII) is seen in the solar spectrum. Would the same line be visible in the spectrum of CN Leo as well? When first inspecting the spectrum of CN Leonis (ESO Press Photo eso0127), Jürgen Schmitt was hopeful: "We saw a strong line, right at the proper location!" But then, he explains, "we soon learned that life is never as easy as expected... that line had a rather strange appearance and something seemed to be wrong". Indeed, the early investigation showed that this line feature might be attributed to emission by singly ionised titanium atoms (Ti + or Ti II), located in a lower atmospheric layer (the 'chromosphere') and not in the corona of CN Leo. However, a subsequent, very careful study definitively proved the presence of the hoped-for coronal emission line. The titanium line is produced at lower temperatures than those that reign in the corona, and the individual velocities of the titanium ions are thus much slower than those of the iron ions in the corona. The broadening of the titanium line, introduced by the Doppler effect (the combined lineshifts by all ions), must therefore be much less. The titanium line must accordingly be much more narrow than any coronal line. 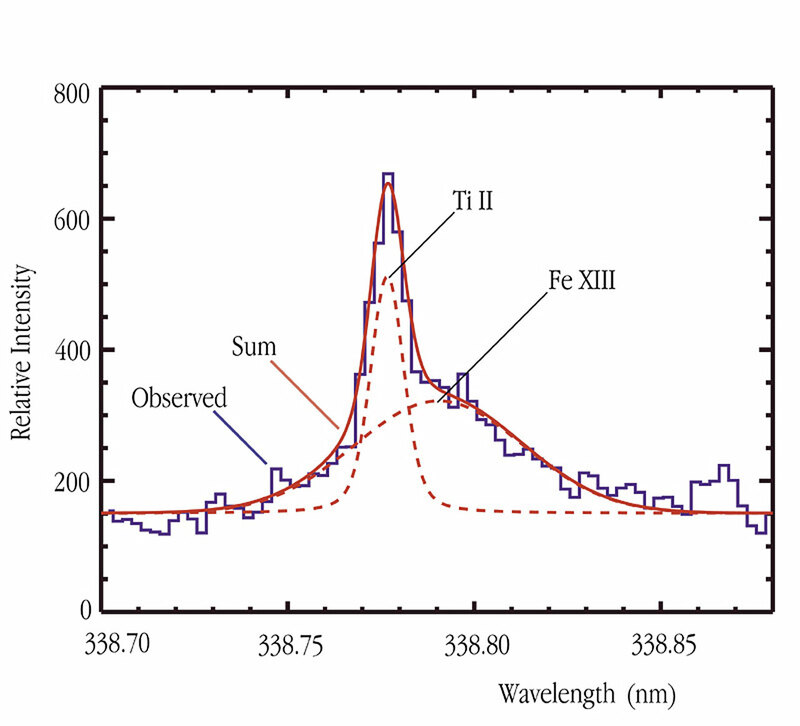 Many other titanium emission lines are visible in the UVES spectrum, and the common width of these lines can be determined with high accuracy. It turns out to be much less than the observed width of the line seen at 3388 Ångstrom, and that line can therefore not be due to titanium alone. And indeed, when 'subtracting' the contribution from the narrow titanium line, an underlying, much broader line emerges and becomes well visible, it is indeed the coronal emission line from 12 times ionised iron (Fe XIII). This is the first time a stellar coronal line has been unambiguously observed in the optical part of the spectrum. This KUEYEN/UVES detection of a coronal line closes the historical loop to the discovery of the solar corona as a tenuous, hot envelope around the Sun. It now opens up a new window for the study of stellar coronae and allows thermal emission from these hot regions to be studied from the ground and not only from space, as this was the case until now. Thus, it is now feasible to use the superb capabilities of ground-based instrumentation which has much higher spectral resolving power than currently available X-ray spectrometers. With the new tools at large telescopes like the VLT, the astronomers may embark on detailed studies of the dynamics of stellar coronae. They will then also be able to watch the expected changes in the emission levels of other stars, similar to the well-known 11-year cycle of the Sun. Eventually, they may also obtain images of stellar chromospheres and coronae. A report on the observations of the 1869 solar eclipse appeared in the first Nature issue (November 4, 1869) and the interesting story about the identification of the solar coronal lines is described in a popular article (John Talbot). A talk by Herbert Friedman about the evolution of X-Ray Astronomy includes a description of the 1949 detection of solar emission in this waveband. 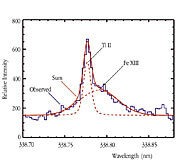 More details about the solar-stellar connection and X-rays may be found in the article by Berhard Haisch and Jürgen Schmitt in the October 1999 issue of the journal "Sky & Telescope" (page 46). The research reported in this Press Release is described in a scientific article ("Light from Stellar Coronae: Ground-based Discovery of Emission Lines" by Jürgen Schmitt and Reiner Wichmann) that appears in the August 2, 2001, issue of the scientific journal "Nature". Jürgen Schmitt has written a popular account on stellar X-ray emission in the German language journal "Sterne und Weltraum" (July 2001, page 544).